The rent at Two BR Apartment - Living at Dakota Park gives you the freedom to enjoy your Apartments ranges from $765 for a one bedroom to a $1,095 two bedroom. Apartments in this building are about 11% more expensive than the Stone Bridge average. This is a pet-friendly apartment. 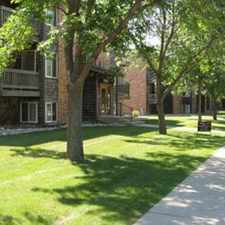 This apartment is in the Stone Bridge neighborhood in Fargo. Nearby parks include Ed Clapp Park, Stonebridge #2 Park and Hampton Park. Two BR Apartment - Living at Dakota Park gives you the freedom to enjoy your Apartments has a Walk Score of 64 out of 100. This location is Somewhat Walkable so some errands can be accomplished on foot. Living at Dakota Park gives you the freedom to enjoy your free time, without the burden of household maintenance. Conveniently located in the South Fargo area, you are within minutes of West Acres Mall, Interstate 29, medical facilities, universities, restaurants, services, and entertainment. Downtown Fargo is only minutes away and is home to Historic Fargo Theatre, trendy shops, and artisan attractions. Enjoying coffee at the local cafe, riding along the bike trail, or relaxing by the indoor pool are easily done while living at Dakota Park. Dakota Park offers a variety of 1, 2, and 3 bedroom apartment homes. Call today to make an appointment or to schedule a showing. Explore how far you can travel by car, bus, bike and foot from Two BR Apartment - Living at Dakota Park gives you the freedom to enjoy your Apartments. Two BR Apartment - Living at Dakota Park gives you the freedom to enjoy your Apartments has minimal transit which means it is possible to get on a bus. View all Stone Bridge apartments on a map. Two BR Apartment - Living at Dakota Park gives you the freedom to enjoy your Apartments is in the Stone Bridge neighborhood. Stone Bridge is the 19th most walkable neighborhood in Fargo with a neighborhood Walk Score of 43.